Why have a review system? Reviews are a proven method for the community to moderate content in peer-to-peer marketplaces. A reviewed listing allows you to get third party recommendations, and evaluate the quality of the produce and food source. To add a review visit the listing page, scroll to the reviews tab, and click Add review. On the page that loads add a star rating, photos and a text review. Remember to always be honest and courteous - offensive reviews will be removed, and use of offensive language may lead to account suspension. Bear in mind that you can't add a review for your own produce1. You can see all the reviews you've posted on RipeNearMe easily by visiting your "my reviews" page. 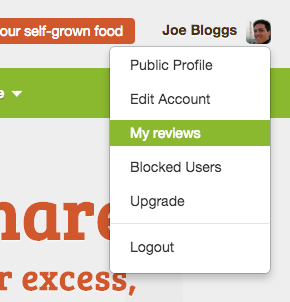 Click on your name top right to expose the user menu, then click "My reviews". What do I do with an unfair review? If you receive an unfair review about your produce, you might want to contact the author of the review and discuss why they were unhappy with the produce. If they never tasted your produce, it’s possible a mistake was made and you should contact the site’s administrator to try to clear things up. You can do this by selecting "Contact" in the bottom right-hand corner. 1Bogus accounts established for the sole purposed of favorable reviews will be blocked.